I bail-citied on BLOGGING a couple of years ago in May! So it’s funny I should regroup and renter the AR BLOGGING Stratosphere in May two years later. I thought it was more like three years. Felt like three. I meant to take a chill pill for about three months. Two years later, here it goes. Rusty, YES. Daunted, NO. Questions, YES. Forgot the points system. Had to spend an hour navigating around in the DARK to figure AR out again. Looks about the same inside but prettier outside. It’s like riding a bike. One you get on the darn thing you start pedaling somewhere. Anywhere is better than Nowhere! Going to get my WP Blog up and running and want to integrate these two platforms. Also, miss the tips and blogging ideas. Miss PEEPS. Miss Real Estate ideas from across the Country. Miss the tech tools and accelerated learning curve for Geeky Stuff. OKAY, she’s B_A_C_K! Water seeks it’s own level! RUST REMOVAL in process. Now I think I have to blab 225 or 250 words. Forgot that, too. I better go hit the questions section again. I think the points goal system I used was a blog post a day and a reblog a day. The rest can kind of come as it may. Oh, and I learned a lot by the comments. They’re up to 20 I think. That’s quite a tall drink of comments but I love to read. Golden Girl is on the Golden Path to Blogging again! Oh no, did they fix the ability to easily add a photo from and iPAD yet? 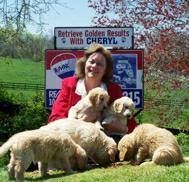 You’ll Retrieve Golden Results with Cheryl Ritchie, RE/MAX Leading Edge, for all your Southern Maryland and Anne Arundel County Real Estate Sales. Visit www.GoldenResults.com for more information. Hi Cheryl- what an absolute pleasant surprise to see you here again!!! Welcome back and I'll be looking for your next post!!! WOW and WOW So good to see that The Golden Girl is on the Golden Path to Blogging again! Welcome back. It is good to see you back on active rain. I came back about the time you took a hiatus. I took a hiatus for quite a while too. I guess we all need them from time to time.